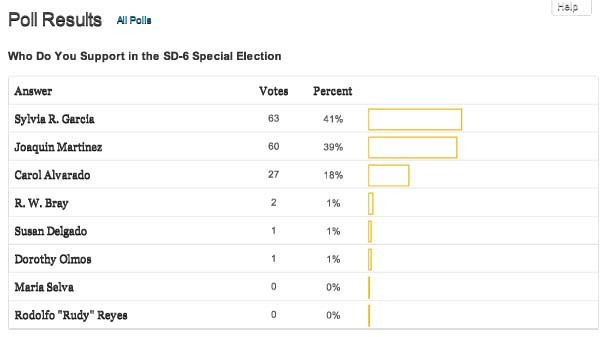 Well, if you live in SD-6 and you are not one of the just over 7,000 who have cast a ballot in the special election, then that means you’re part of the 97% (or so) who are either suffering from election fatigue, don’t like any candidates, or are just plain apathetic and probably won’t even read this post. Or maybe you will come out in droves today and Saturday. Today is the last day that you can cast a ballot at any early voting location. Come Saturday, you will need to vote in your assigned precinct location. Hopefully, the Ethics Commission will post the 8-day finance reports to see what kind of money has been spent in the run-up to election day. Waking up to the local news this morning, I did catch at least one-ad each for the well-financed candidates. Whether the ad buys were in the first report or these are new expenses, we shall see. With close to or over a million dollars being spent by the candidates and over $400K by the county to put on this election, let’s hope for a big jump in participation. Kuff has numbers and projections. After all the pedo ruckus some of us made a while back, it looks like Mayor Annise Parker finally got a Labor dude on the Port Commission, Dean Corgey. Since everyone was talking about “firsts” after another appointment, is it safe to say that the working people got their first representative on the commission? Looks like a wealthy lawyer is once again making noise about running for Houston Mayor. We’ve all been wondering, from which direction will he run at Mayor Parker? The Chron talked to him. That’s a bold statement from someone who has walked those halls for a long time, too. It’s about that time to start thinking about the 2013 Elections. With all the activity at Houston Community College lately with what will end up being two appointments, I’ve had my ear talked off about another HCC race–District I. Yes, that one is up again. Unfortunately, my own HCC trustee has resigned, but he leaves after producing some good results: Thank you, Richard Schechter! Now, the City elections will be interesting. At-Large 3 is open, as is District I–one of the Latino seats. Both will have a long list of candidates. Will any current Council members be targeted? Well, with the Mayor getting a well-financed challenge, it’s possible that some would want to try some sort of coattail riding–if coattails even form. So the DC will have the ojos open. State Rep. Senfronia Thompson (D) shot up the DosCentavos.net rankings for favorite legislator with her filing of a bill that would allow liquor stores to be open on Sundays. Texas could potentially gain $7.5 million in new revenue every other year if the Sunday ban were lifted, according to a 2011 Texas Legislative Budget Board analysis. Texas is looking for all sorts of new revenue without raising taxes and this is one idea that I enjoy. I don’t know how many Sundays I’ve spent thinking, “If only I could go buy a new bottle of Makers Mark today.” Seriously. Beyond the love of libations, this just makes sense. If anything, I wish Texas was more like New Mexico, where I can walk into any Walgreens to buy a bottle of something. But this is definitely progress. My post this morning about the start of early voting earned me a call-out about my take, and let’s just let be known that if you call me out and state your case, then, I can be a fair guy–even though this blog wasn’t designed to be “fair and balanced.” But I may just take the pay-route like the Chron, so, be warned. What seemed to me like an attack on Alvarado’s work for METRO was specifically about the East End rail line and the problem with running the new light rail line across the existing freight rail line crossing on Harrisburg and Hughes. One solution, which METRO supported, was an overpass–a six-block long bridge over the freight line, 26 feet high. While many of the politicos supported it or thought it feasible, business owners and residents called for an underpass–below the freight line. So, as stated in the article, State Rep. Alvarado was hired as a consultant to find funding for the added cost of the project (bridge or underpass project). In the direct mail piece, Garcia seems to question Alvarado’s work for METRO in support of a bridge while also serving the same constituents who did not support METRO’s idea of a bridge. In his response to the mail piece, CM James Rodriguez took exception to Garcia’s line of attack and provided a link to a letter from then-commissioner Sylvia Garcia which had stated that she supported “the concept of a bridge or underpass” at the freight rail crossing, and not just the underpass. Citing comments regarding elected officials and “guts” made by Garcia at a candidate forum, Rodriguez challenged Garcia by stating that many of the area’s officials worked to find the funding for the project and that Garcia did not attend meetings on seeking a solution. Rodriguez further stated that Garcia “declined” to contribute County money to the project. In fact, Garcia’s letter stated that there was no provision in the county’s most recent bond referendum for this money and that the county was “not in a position” to commit money for the proposed bridge. So, hopefully, I’ve provided background and fairness to this whole thing about a mail piece. Obviously, there are differing takes and opinions to this whole thing and I have some of my own. Needless to say, the people got an underpass and that’s what matters. To add a bit more fairness, there was a lot of online rumbling from supporters of Joaquin Martinez, who pointed to the two “serious” campaigns’ warring as a means of pushing the alternative–Joaquin. When other bloggers and even the Chron minimize the other candidates, they tend to get a little upset. As someone who has worked with those kind of candidates, I don’t blame them! But we all know political realities, and those other candidates do, as well. As far as attacks go, let me say that I seldom mess with people’s livelihoods or personal lives when working campaigns–too many people can get hurt. The bigger story here is that the Texas Legislature was built to be occupied by wealthy people, or at least those who make enough money in their endeavors in a year that they are allowed to take 140 days off to be in Austin. (As if they don’t do Lege work the other days, right?). We seldom question the rich lawyers in the Lege about their money, thus, I’m not a fan of questioning anyone else. Why can’t they all be like the late, great Ernie Glossbrenner? But that’s for a whole other blog post. The Lege Begins: What’s Your Priority? Posted on January 7, 2013 | Comments Off on The Lege Begins: What’s Your Priority? There’s no doubt that Latinos take a hit every time the Republican-led Texas Legislature meets. $5 billion in cuts to K-12 funding affects Latino kids who make up a majority of all Texas students. $1 billion in higher education cuts affects Latino college students who were made an admissions priority, yet struggle with college preparedness because of the K-12 cuts. Add to that cuts to health care, and, no doubt, a vicious circle appears that threatens to do in the State of Texas. The Center for Public Policy Priorities released a statement today after the State Comptroller released a higher estimate than expected of the revenue that will be available for the next biennial budget. “Today Texas lawmakers heard they will have $101.4 billion in General Revenue to work with when writing the 2014-15 state budget. However, $5 billion is needed for the Medicaid IOU, leaving $96.4 billion to barely continue the current barebones budget and leave in place the devastating 2011 cuts to education, health care, and other areas of critical need. In addition, the state’s Rainy Day Fund will have $11.8 billion available to support state services and investments by the end of 2014-15. “With available revenue and the historically high Rainy Day Fund balance, which together total $108.2 billion, Texas lawmakers have the opportunity to return to the level of services provided five years ago—-before the financial crisis slashed state revenue. If we are willing to use the Rainy Day Fund, we could fund the rapid population growth and inflation while also undoing the devastating 2011 cuts that have left so many Texas families struggling. “Today’s revenue estimate announcement officially begins this session’s budget writing process. Now, it’s up to state lawmakers to create a budget that reflects our state’s needs and priorities. “Legislators should use the money available now to invest in the education and health care systems that will help ensure our state’s future prosperity. If only it was that easy with the vicious Republicans at the helm. I say vicious because their attitude exhibits more than just plain carelessness as elected leaders, but a lack of care for their fellow Texans. Much like Boehner’s Republican Congress, it’s all about paying back their political contributors–the wealthy Texas corporations. I was having a conversation with a Republican Latino friend from Denver Harbor and we both agreed that somewhere along the line there needs to be middle ground on which to move legislation that takes care of the people, the schoolkids, the college kids, and those who need health care. I even admitted that, as liberal as I am, even I understand the need for compromise. But if his side is going to talk or act crazy, then I’ll sound so left that I’ll put a few Latin American Presidents to shame. So, while I’d love for the Texas Lege to come together and do the right thing, perhaps discuss the Texas HOPE legislative priorities, I expect for the Latino community to be on the defensive again from Republican attacks. Once Rick Perry rattles about his non-existent voter fraud and sanctuary cities, and when some other righty whines about HB1403 (Texas DREAM Act), Republicans will once again prove themselves a failure. Of course, we will fight back! But if the Republicans prove me wrong, well, great! Best of luck to my State Rep. Gene Wu and the rest of my friends in the Lege. Comments Off on The Lege Begins: What’s Your Priority?